A paper from Nature Geoscience (reported by the BBC here) claims that the carbon dioxide humanity has pumped into the atmosphere is holding off a new Ice Age. Given that the earth has mostly had more carbon dioxide in its atmosphere and has been significantly warmer than today (see here), could warming be a net positive in the long term? An alternative and perhaps more vivid way to phrase this question in a way that highlights the issue could be: is the current world climate optimal for humanity or biodiversity? N.B. It might be worth distinguishing gains to life in general from gains to humanity as we emerged in a cold climate and tend to live near coastlines which might change as warming happens. Edit: Recent statistical palaeontology studies have resulted in a change of mind about biodiversity over geological history. Mayhew's group had previously argued that warm periods had low biodiversity (despite the opposite being the norm across today's world where the tropics teem with biodiversity). A reanalysis has reversed the original result (see nature news story). It is also worth noting that one author of the work doesn't think this is relevant to current warming (though this is opinion is not derived from his current results). If you're referring to human life, there are recent studies from the Europe and Australia regarding the effects of temperature changes on humans. They figure that initially warming will actually reduce deaths due to cold (i.e. fewer people will succumb to hypothermia during cold spells) but in future decades the number of deaths due to more frequent and more extreme heat waves will far outweigh the reduction in hypothermia cases. Logically speaking, any time weather events become more extreme, some life forms are going to be adversely affected and some will find new niches. Better or worse? Hard to say with certainty. Life will definitely be different. If you're one of the species who finds new/expanded habitat, then climate change may be good for you. If you're one of the species that loses habitat, well, now would be the time to buy a nice helmet. On the theory of natural selection, the extinction of old forms and the production of new and improved forms are intimately connected together....[T]he appearance of new forms and the disappearance of old forms, both those naturally and artificially produced, are bound together. [W]e predict, on the basis of mid-range climate-warming scenarios for 2050, that 15–37% of species in our sample of regions and taxa will be ‘committed to extinction’. The question of whether biodiversity or total biomass is a better measure of what is "good for life" is subjective, although I suspect most would say a coral reef is "better" than a mat of algae. At human timescales? No, global warming is very bad for life on the whole. At geological timescales? It could be very good for life. Or neutral. Or extremely bad. 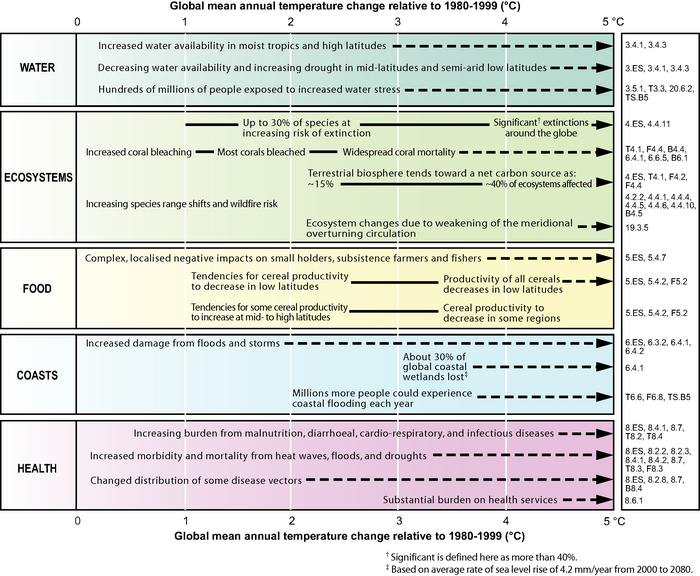 Looking at a scale of decades to a century or two, global warming is very bad for life as a whole: both human life, and global biodiversity. That's not to say that there won't be individual winners, as well as individual losers. As one habitat shrinks, so another habitat extends. Oceans warm, and acidity increases, meaning that species such as coral which are highly sensitive to temperature and acidity, will suffer hugely (DOI:10.1126/science.1152509, and pdf). This will open up new ecological niches, that will allow some other species to expand in the very short term, and evolve to suit the new niches, over centuries. The problem, as with changing sea levels and other ecosystem shifts, is not that the final equilibrium result is necessarily worse than the starting point: it is that we have built our civilisation based on the existing ecosystem; and the climate and ecosystem are now changing faster than our civilisation can adapt. At the scale of decades, short by evolutionary standards, environmental change is more rapid than genetic change. Whereas previously the Earth has seen periods of warming and cooling that have raised or lowered the temperature by several Kelvin, those have happened over thousands of years or longer. Now, all the evidence is that this is happening over decades. This, combined with humankind's other environmentally degrading activities, means that Earth's ecology is now going through its sixth mass extinction. So it's an issue of rate of change of climate. At the moment, with a "business as usual scenario", we're on course for a global mean temperature change of 5-7°C or so, which would mean a loss of 40% or more of species. If we succeed in rapid mitigation, we can lessen the biodiversity impact so that there's a risk of losing "only" 30% of species. Looking at a scale of thousands of years upwards, things become much more speculative. We know that there are positive and negative feedbacks in the system. At some point, positive feedbacks will get balanced by negative feedbacks. However, we don't know how hot things will have got before then. Or what sort of life might be viable. However, some forms of life do seem extraordinarily tenacious even at the very extremes. Not the answer you're looking for? Browse other questions tagged environment climate-change climatology .